This unique property is definitely one of a kind. The home is straight out of Architectural Digest. 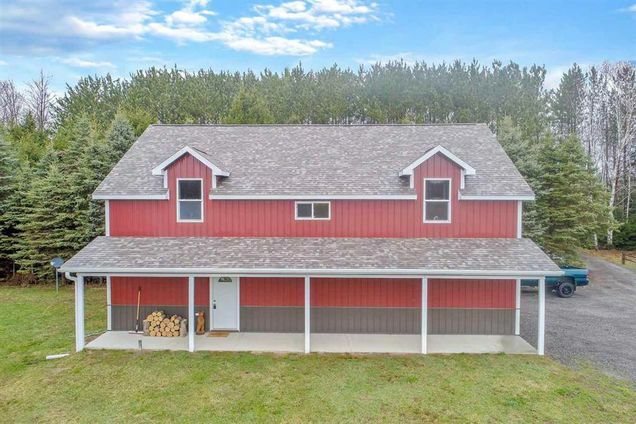 Considered a Barnominium, this 1418 square foot 2 bedroom, 1 ~ bath home is located on 14.64 secluded acres, with pines, birch, and open fields to view the large buck coming in from your 5 x 8 2nd floor deck or 6 x 48 recessed can lit covered front porch. This home features an open floor plan with an incredible view from every window, cathedral ceilings, recess cans, and modern pendant lighting, first floor with ~ bath and spacious laundry/mud room. There is also room to add another master suite, on the first floor, if desired. This home has cozy in floor radiant heat, a pellet stove on the first floor, 2+ car garage, with oversized doors. This property has top notch soil. Additional acreage is available, as well as survey. North of Swaffer, West of Hess. M15 to Brown, to property between Hess and M15. No sign, no mailbox, 2 orange posts at driveway. Hello, I’m interested in 5071 Brown Rd and would like to take a look around. The details on 5071 Brown Rd: This house located in MI 48746 is currently for sale for $269,900. 5071 Brown Rd is a 1,418 square foot house with 2 beds and 1.1 baths that has been on Estately for 8 days. This house is in the attendance area of Vassar Middle School, Vassar Senior High School, Central Elementary School, and Townsend North Elementary School.